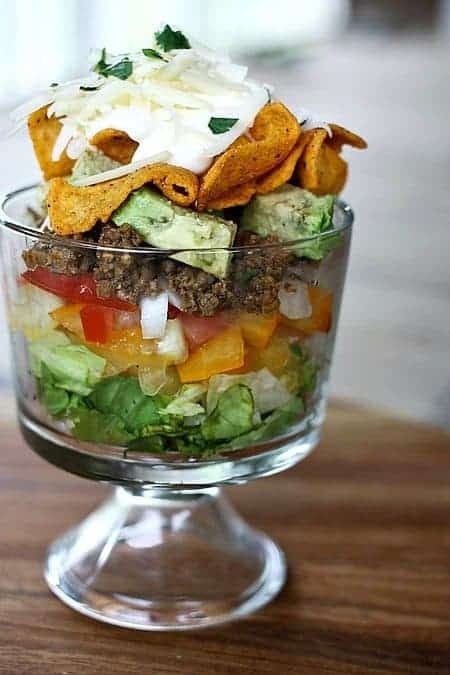 Taco Salad. We all know how I feel about it. In short, I love it madly. And mercy… there are so many ways to make and serve them. Really, there’s only one acceptable way to eat them, and that’s to INHALE them, so we save the creativity for presentation. Today’s take on a taco salad makes it downright pretty -it’s true- but it also makes it the fastest taco salad this side of the Pecos. There’s just something so eye-catching about the multi-coloured layers and something so fun about digging down through them to find the next good bite. It’s true. Taco salad hits every single happy note a food could possibly hit for me. It’s not just delicious, varied in texture, fresh, and fun, though… It’s also wallet-friendly, simple, versatile, and lightning fast to make. How so? A taco salad usually uses up the odds and ends from taco night, but almost any leftover meat will do. 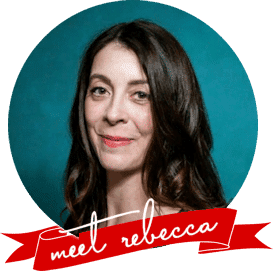 Are you plumb out of taco meat? Use leftover browned sausage, chopped leftover chicken, pork, grilled fish, or even crumble leftover hamburgers. If the meat’s a little on the dry side, it can be refreshed for the purposes of taco salad with a toss in whatever dressing you’ll use for the salad; be it taco sauce, Greek yogurt, or Smoked Paprika and Chipotle Sauce. You needn’t worry TOO much how that makes the meat look, because it’ll be surrounded by all sorts of pretty vegetables and other goodies that will distract your eyeballs. You chop your vegetables and layer them with meat and other toppings; it’s a full meal-in-one-dish that’s completed so fast you’ll wonder if you forgot something. And if you did forget something, never fear!, you can just add another layer! 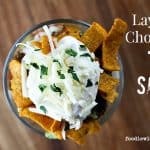 I love serving these Layered Chopped Taco Salads in individual bowls. I usually serve them in bigger bowls than pictured above for the purposes of digging your fork in and mixing them about, but I wanted to be able to show all the layers of this salad. The beauty of the individual serving is that you can fully customize it for everyone’s individual preferences. No tomatoes for Kid #2? Leave them off of his serving. Kid #1 doesn’t care for avocados? 86 them on his. 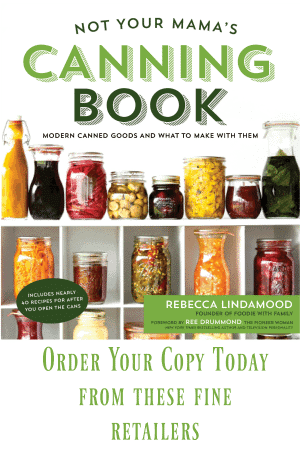 It’s an easy way to keep everyone happy at the table without having make 7 different meals. Taco salad does not hold particularly well in the refrigerator, so I advise taking the individual serving approach. 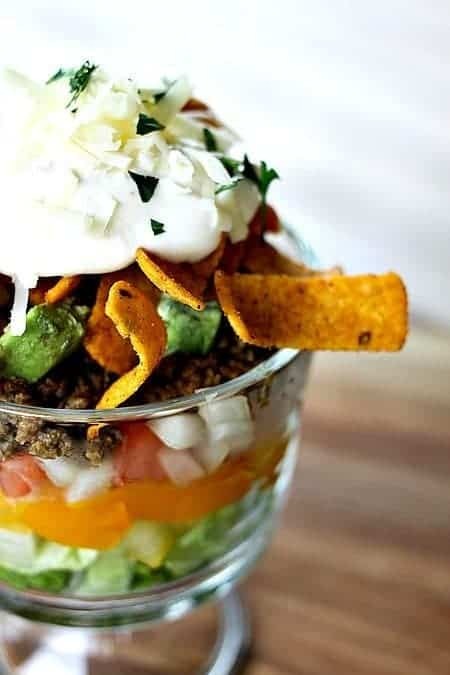 Layered Chopped Taco Salad is a very ‘family-style’ friendly meal. Place all of the ‘layers’ in their own bowls and let people assemble their own salad at the table. Pass dressing, Greek yogurt or sour cream, or Smoked Paprika and Chipotle Sauce. Layered Chopped Taco Salad is ideal for parties, because you can serve it buffet style, too. Guests can assemble their own salad. Again with the pleasing everyone! Depending on the type of meat you choose, it could be tasty served cold. Grilled fish and chicken are both nice cold protein options for Layered Chopped Taco Salad. I find ground beef or turkey that was prepared as taco meat is better served warm. Pulled pork can go either way, depending on preference. Sliced leftover steak is wonderful cold. Go with what you have! There’s a little strategy involved in the order of layering. Lettuce goes first, of course. I like to add tomatoes next and then onions. The acid in the tomato takes care of any residual ‘sting’ from the onion. Onion is an ideal platform for the meats, because if you’re adding a warmed or hot meat, it can take it better than tender lettuce or tomato. On top of that meat or protein you should add the cheese for melting purposes, although grated cheese is also nice against the cold meats or proteins. From there, it’s a little more loosey-goosey. I like to put my avocados on top of the cheese followed chips and various dressings, but that’s really just personal preference. I’d say once your cheese is in place, pile it on at will! Let’s talk chips for a moment because you KNOW a taco salad needs crunch. I’m partial to Chili Cheese Fritos, but we also love roughly broken tortilla chips, broken leftover taco shells, and these (seemingly incongruous) Za’atar Tortilla Strips. 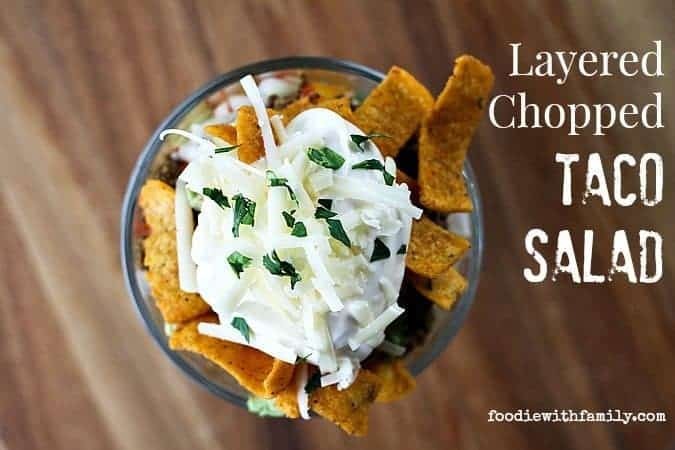 And although we’ve never, ever, EVER had a single leftover with which to try this, I imagine the Homemade Cool Ranch Doritos would pretty much rock everyone’s world in a Layered Chopped Taco Salad. Another advantage of individual servings made right at the table is that the chips stay crunchier! leftover taco meat rewarmed, or leftover pulled pork, cubed chicken, sliced steak, flaked grilled fish, sauteed mushrooms, tofu, or any other taco protein. Serve each of the toppings in an individual serving bowl. At the table, fill plates or bowls at least 1/4 full of chopped lettuce. Add a layer of any or all of the toppings in the order listed and serve immediately. I make tacos almost every week. But not on Tuesday. Because I’m a rule breaker. Love these – I mean, the Fritos on top are clutch! I think this is the cutest thing ever — love your photos, too! Taco salads are my life. I think I could eat them every day. Especially if I could customize my own adorable cup of them! Love the individual serving! And the colors are so bright too! I think if I could only eat one meal for the rest of my life, it would be taco salad. Seriously. We are loving taco salads over here this summer. I just keep changing up the ingredients each time I make it. I love your individual approach. Great idea. I should know better than to visit your place hungry ; ) Want. Now. 1) I want that little trifle bowl. 2) I want this taco salad sometime soon. 3) fritos. Three being the most important. Fritos complete me. I love taco salad and yours looks amazing! Definitely want to try this, you’ve been pinned! Taco salad is my absolute favorite! These photographs are so beautiful. Layered salads for dinner are a perfect summer dish! I love taco salad too! It’s a fave of mine. This looks so good, especially with the Fritos! Tacos are my jam! We have tacos AT LEAST once a week here and It never gets old. I love the layered option. In my house they hover impatiently as I build them each several tacos. I can imagine them spooning this out without even allowing me to finish! Now THIS is my favorite salad – gorgeous photos! Man oh man, that looks fantastic. It reminds me of a local dish called Petro’s Chilli and Chips which are my favorite variation of “frito pie”. So much going on here, I’d LOVE these!